Death Cab For Cutie frontman Ben Gibbard had a lucky escape at a show in San Diego last week when he was stung by a scorpion backstage. Twice. Shortly before taking the stage, Gibbard was changing into the trousers he intended to wear onstage when he felt something sting him twice in the thigh. "We all screamed. 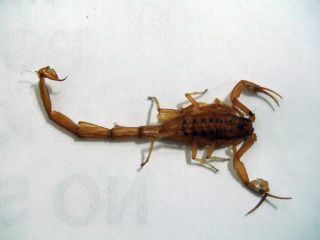 A scorpion was honestly the last thing we could imagine that would come scurrying out of his pants. Ben said that it felt like a wasp stung him and it didn't hurt so bad, but it sure rattled all of us. "A scorpion was honestly the last thing we could imagine that would come scurrying out of his pants." "We called the EMTs [Emergency Medical Technicians] and they checked him out and thankfully he was fine and able to play the show, he said he had scorpion power in his veins. "I'm still not convinced that he is 100% fine because nobody eliminated the possibility that it was a radioactive scorpion and that Ben will now develop super powers, so I'm keeping a close eye on him just in case."